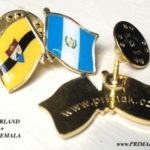 Odznak vlajky přátelství LIBERLAND + GUATEMALA z obecného kovu, barevný, přípínací do klopy saka. 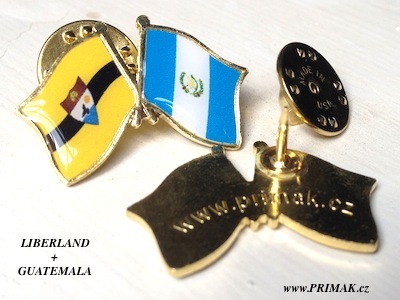 Badge flag friendship Liberland + Guatemala from the base metal colored to the buckling lapel. Production of badges friendship. State flags, banners State Czech repupliky zraele as a symbol of Czech-Israeli friendship. This example is a separately manufactured coined badge, cutting out (carved) with irregular outlines of two plapolavých flags. On the badge is applied subsequently printed. It is a badge difference whether the hand-painted or printed is visible when viewed at an angle contours in contour markings are hand-painted in metal color. The contours are formed by the metal into the spaces is then manually applied paint. Advise hanging flags, wearing … Left side – home flag (important) on the right side – visit. 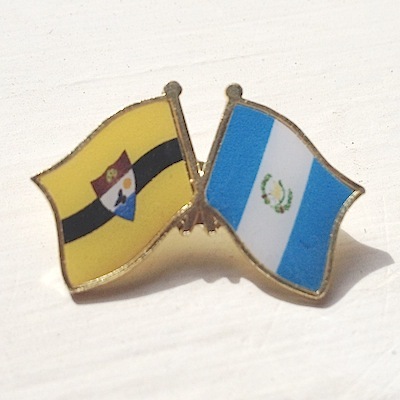 It can produce any combination of flags for this kind of badge can be printed any variation of any state, or even clubs in any color combination. 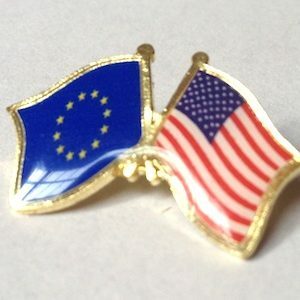 To produce badges flags used embossing and printing, it is also possible to use a combination embossing painting or manufacture of badges embossed enamel. Wall so can be used to manufacture flags badges surface silver plated or silver plated LAKOVANY or use rhodium.